Finding vintage board games in charity shops can be a bit hit and miss. Some days there is nothing at all. Other days you don’t have arms big enough to carry everything you find. The latter was the case when B and I went on a recent trawl round the charity shops of Upminster. We were there to tick off a few District Line stations on our Tube Stop Baby Challenge but decided to use the opportunity to see if there were any vintage board games to be had and I’m so glad we did. Mainly for finding The Cooking Game. We’d found a variety of games in the charity shops and were feeling very pleased with ourselves when we agreed to just go in one last shop before catching the tube home. That particular shop had one game in that we wanted, but as I walked towards the till I quickly cast my eye over where the jigsaws were as experience has shown me that charity shops often end up confusing the two and there are sometimes games to be found nestling between 1000 pieces scenes of the English countryside. My mini-detour paid off when I spotted The Cooking Game on sale at a bargain price of just £1.99. Published in 1984 by the The Garden Game Ltd this has the subtitle of “the delicious new family board game” and my interest was immediately piqued. The box shows a variety of outdoor landscape scenes and also a load of food ingredients. What is The Cooking Game? Other than a note saying “with recipes by Jane Grigson” the front of the box doesn’t really give away much of what the game is about. Turn it over though and you get a black and white picture of the game board and a bit more information. 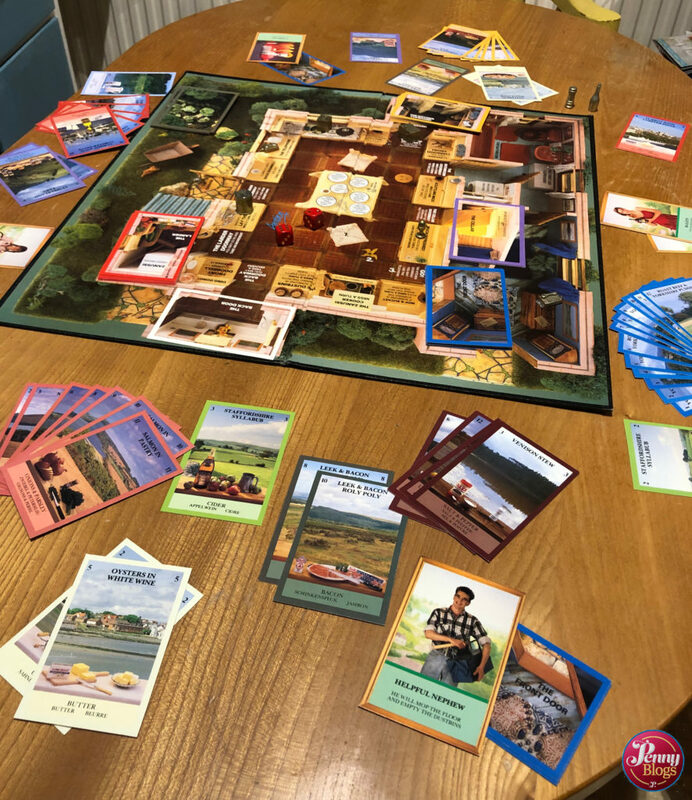 As a game for 2 – 6 players it is described as “fast-moving, funny and informative” and I can see why. 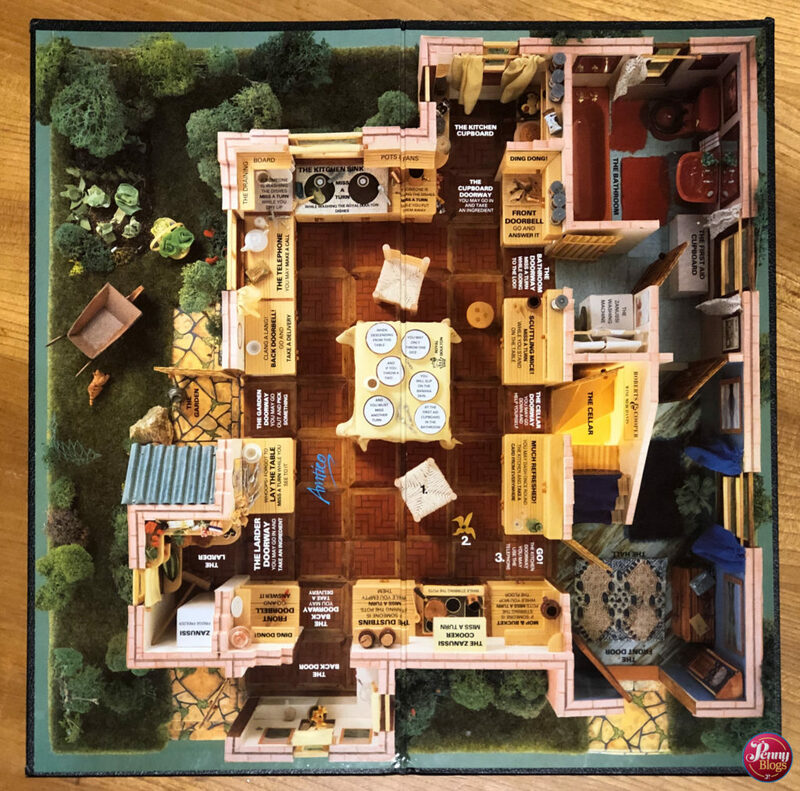 The aim of the game is to be the first player to collect all the ingredients for at least two courses of a dinner – a main course (consisting of 12 ingredients) and either a starter or a pudding (each consisting of 6 ingredients). The recipes that you are collecting ingredients for are created by Jane Grigson, at the time one of the country’s best loved cooks. 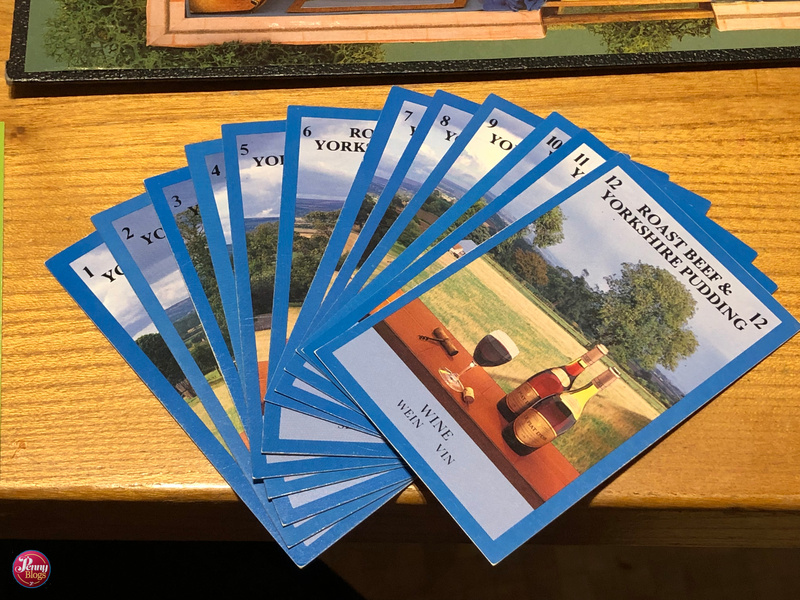 The recipes all come from different parts of the British Isles, and to add an educational angle to the ingredients on the cards are written in several different languages. You basically go around the board collecting cards when you land on the doorways to these places. You either collect an ingredient, or in the case of the Front Door you find Front Door Arrivals. These are helpful people that can help with some of the chores that you find as you go around the board. This means you could get a fetching you man delivering a Dishwasher, or a Niece who will dry the dishes. The Front Door can also mean the arrival of various extras to enhance your meal. Possibly a bottle of Campari, or some After Eight Mints. Between the doorways on the board are a variety of chores and hazards which might involve you having to miss a go whilst you sweep the floor, or possibly even climb up on to the kitchen table to avoid scuttling mice! This has to be the only board game that I have encountered that involves going to the loo! Yep, you read that right. If you land on the bathroom doorway then you have to miss a turn whilst you “go to the loo”. The real twist in the cooking game is the fact that at certain positions on the board a player is able to make a telephone call. You can make a call to ask any other player if they have ingredients that you need for your recipe. It’s not as simple as just asking and getting though. You can only ask if you already hold two ingredients for that recipe yourself. Also, whilst on the phone, if successful with your first request, you might ask for ingredients for a second recipe. If they don’t hold what you need this time round though the person you telephoned may instead ask you for up to two sets of ingredients. In other words telephoning someone can be risky business as it might actually result in you losing some of the ingredients that you hold. Phone at your own risk. 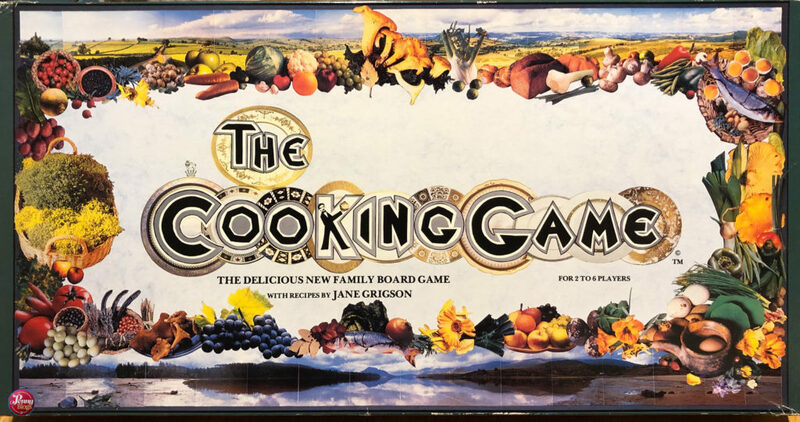 The Cooking Game ends when one player has all the required ingredients to make one main course and one starter or desert. You then move on to the scoring stage of the game when I think everyone playing hopes that they haven’t consumed so much wine that they can’t do the maths involved. With points allocated to completed recipes as well as for each ingredient in a complete recipe players can also get additional points for extras they may have picked from the Front Door like After Eights or Flowers. Things then get really complicated though with points for “impure recipes”. In other words, if you can convince the other players that ingredients you hold can be combined into an acceptable course then it can score you points!This could be something as simple as Strawberries and Cream, or something much more complicated, with no limit on how many ingredients an impure recipe can contain. It’s therefore quite possible that the person who finishes first isn’t necessarily the winner. It’s obvious that The Cooking Game wasn’t a big budget production, yet the finished result, although dated, was a quality product. The playing pieces in particular are really weighty and made of metal, rather than the plastic that you might get today. One of the reasons for this touch of quality is probably the fact that the game had a number of sponsors. The instruction booklet has five pages devoted to them and they also appear throughout the game. I’ve already mentioned cards bearing After Eights and Campari, but all domestic appliances in the game are from Zanussi, the luxury vinyl flooring in the kitchen is from Amtico and the house’s cellar seems to be sponsored by Roberts & Cooper wine merchants. 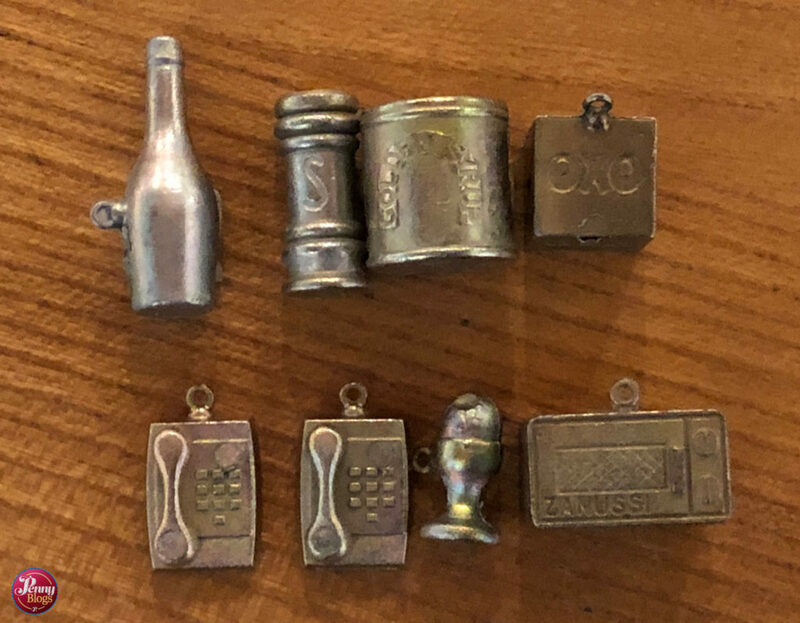 Even the playing pieces are linked to the sponsors with a bottle of Piat D’Or wine, a tin of Tate and Lyle Golden Syrup and an Oxo cube as playing pieces. The prize for most obscure sponsor though has to go to the Halifax. At the time proudly still a Building Society, and sponsors of the two spare cards in the game. Random! 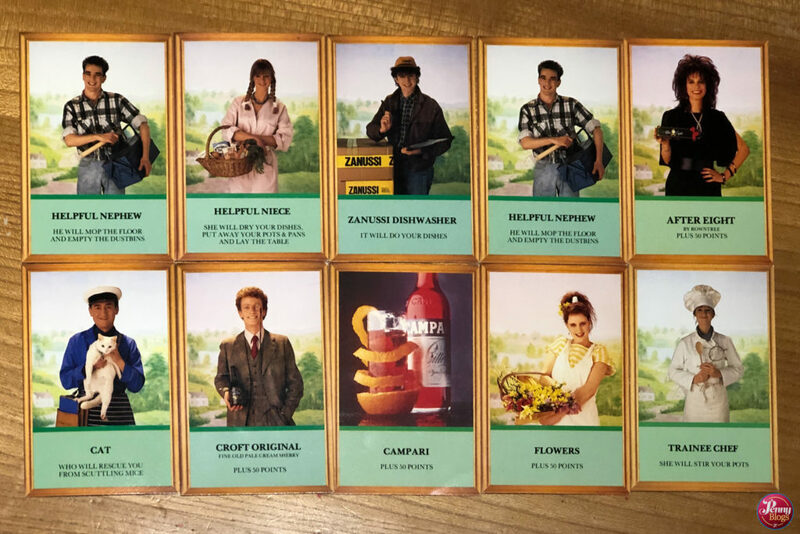 We actually had great fun playing The Cooking Game, but it really was like being back in the 80s in so many ways. The style of recipes, the cards and game design, and the whole notion of having elaborate dinner parties. 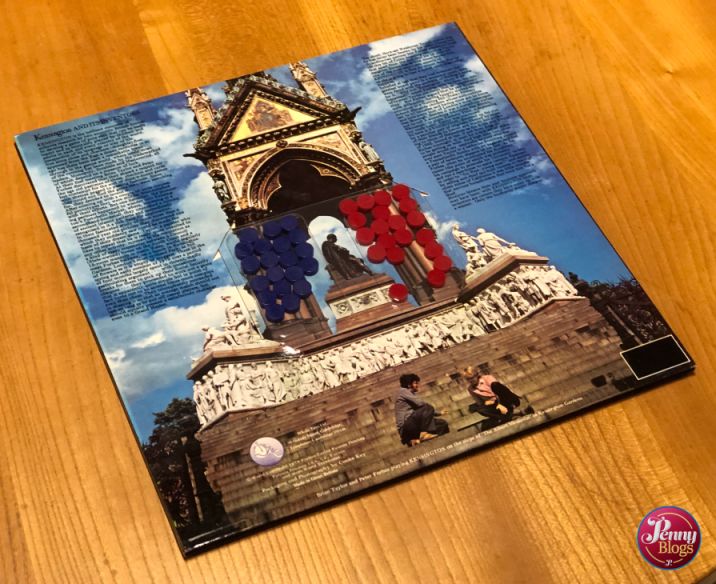 If that weren’t enough the instruction book tries to explain how the telephone call part of the game works by giving examples of two couple playing the game – Charles and Diana, and Paul and Linda! If you want to experience The Cooking Game for yourselves then why not join Bonn and myself as we play on the Hobbies and Interests podcast? Look out for the new episode that will be released very soon. It wasn’t until Little Miss C started reading the HTTYD books that I became familiar with Hiccup and Toothless, the stars of the How to Train Your Dragon books and films. Following on from reading the books came the films and it didn’t take long at all before she became a huge fan of Cressida Cowell’s magical creations. It goes without saying that she is massively excited about the new film How to Train Your Dragon: The Hidden World. As with most large film releases like this, there is rather a lot of related merchandise on the market right now – or arriving soon, if what I saw at last week’s Toy Fair is anything to go by. 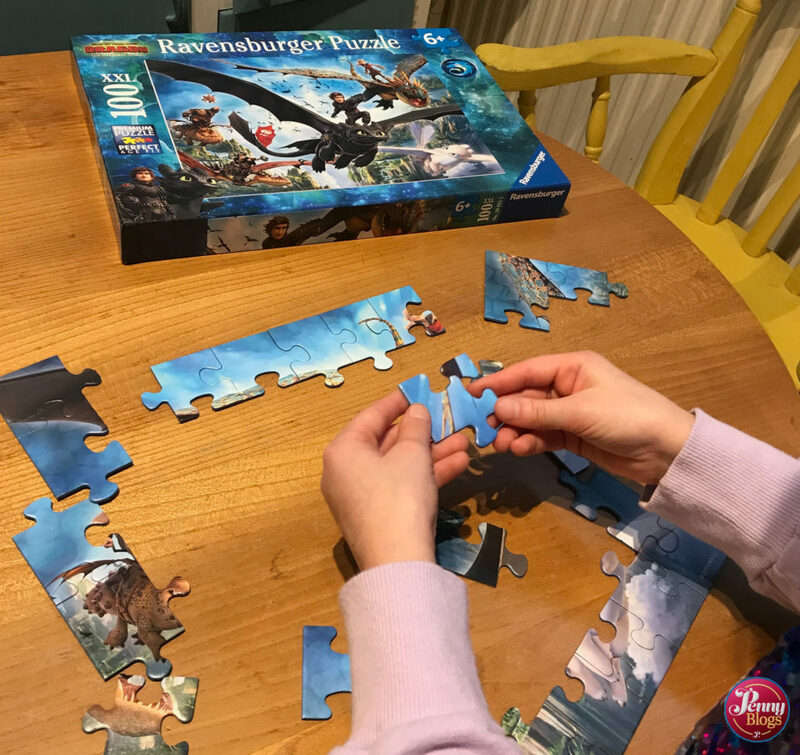 LMC has seen the hype surrounding the film’s release and was therefore delighted when Ravensburger sent us this How to Train Your Dragon 3 jigsaw puzzle to review. With 100 pieces the puzzle has a suggested age range of 6+ and it seemed to be the perfect size for 8 year old LMC. Large enough to be a bit of a challenge on a wet Sunday afternoon, but not so complicated that she needed help or that it took too long to complete. With Toothless and Hiccup taking centre stage in the picture, they are joined by various other characters from the film, including Astrid and Stormfly. There are plenty of characters in the picture making it relatively easy to complete those parts of the puzzle. Meanwhile the scenery sections near the bottom provide a bit more of a challenge. 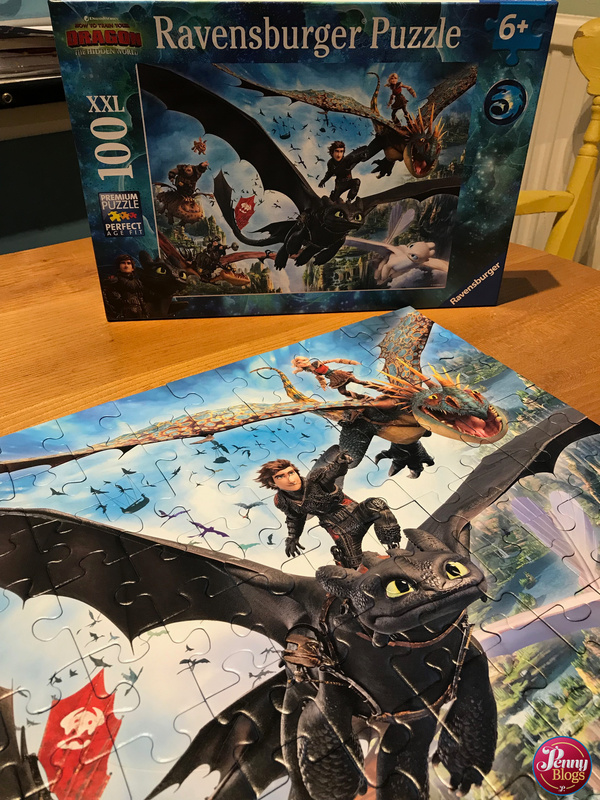 For How to Train Your Dragon fans who enjoy jigsaw puzzles this makes the perfect gift for occupying them when the weather outside is encouraging you to stay in the warm and dry inside. 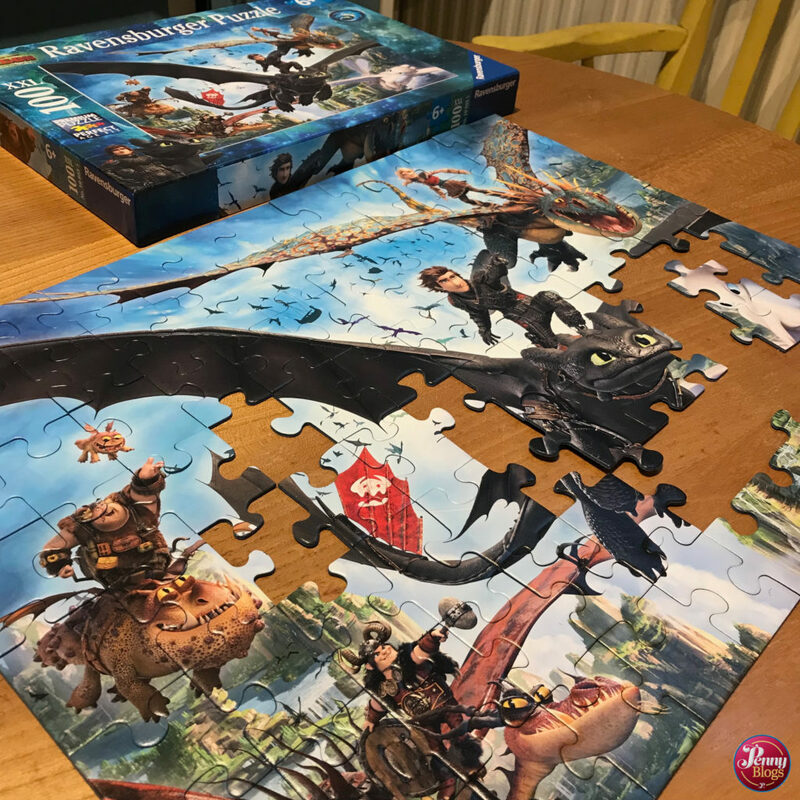 This How to Train Your Dragon 3 jigsaw puzzle is produced by Ravensburger and is priced at £8.99. It contains 100 XXL pieces and is aimed at children aged 6+. It is available to buy online here. 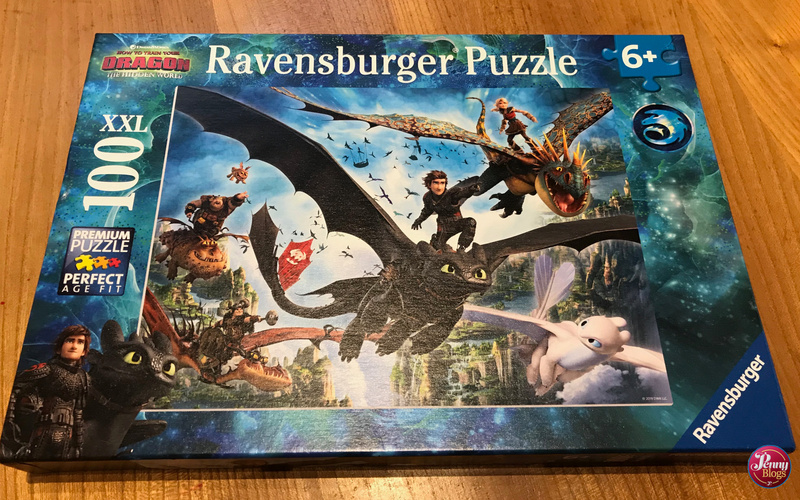 Disclaimer: We were sent this How to Train Your Dragon 3 jigsaw from Ravensburger for the purposes of this review. All opinions remain my own. This post contains affiliate links. Kensington was a bit of a chance find in the charity shop. Bonn collects vinyl, so he always keeps an eye open for it and when he first picked up Kensington that’s what he thought it was. 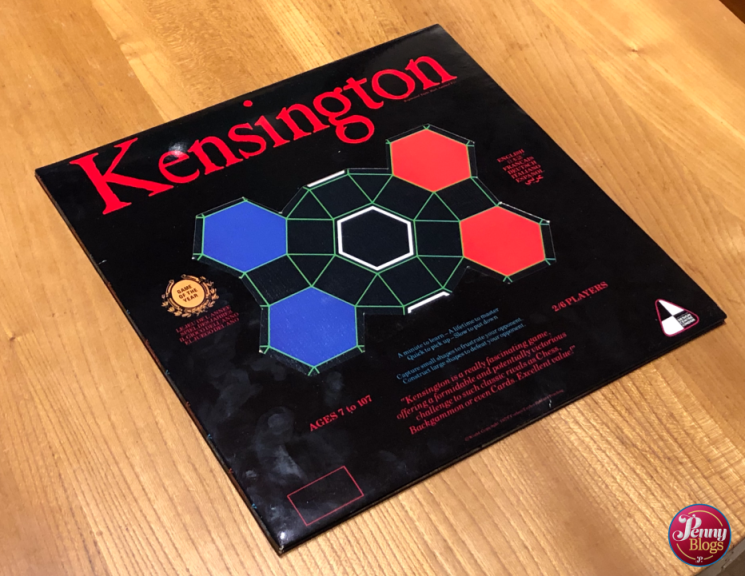 Kensington is certainly packaged differently to any other board game I’ve come across. The board is inside what looks like an LP sleeve and as it was a game from the 70s I’m guessing that this was done so that it would just slip inside a record rack, which most people seemed to have then. You could almost imagine someone pulling it out with a flourish after deciding what record to put on after dinner. 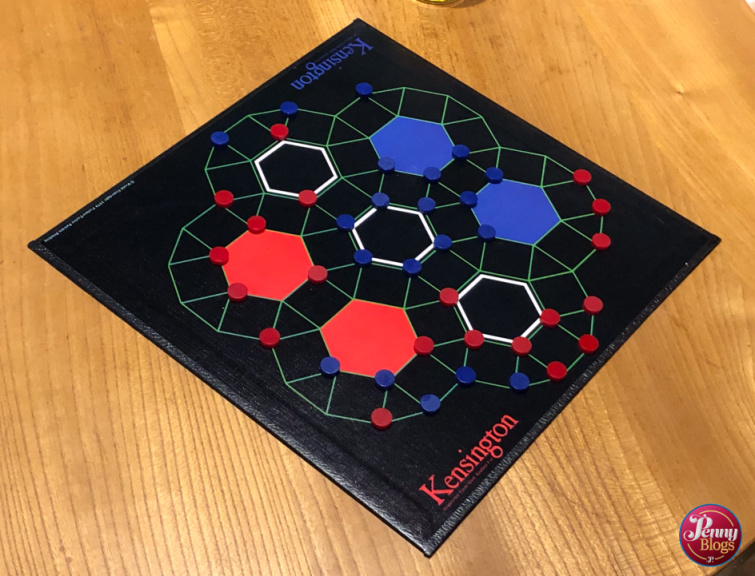 Kensington is described as an abstract strategy game and it was devised by two British guys who, according to the blurb on the back of the game, seemed rather proud of their creation. 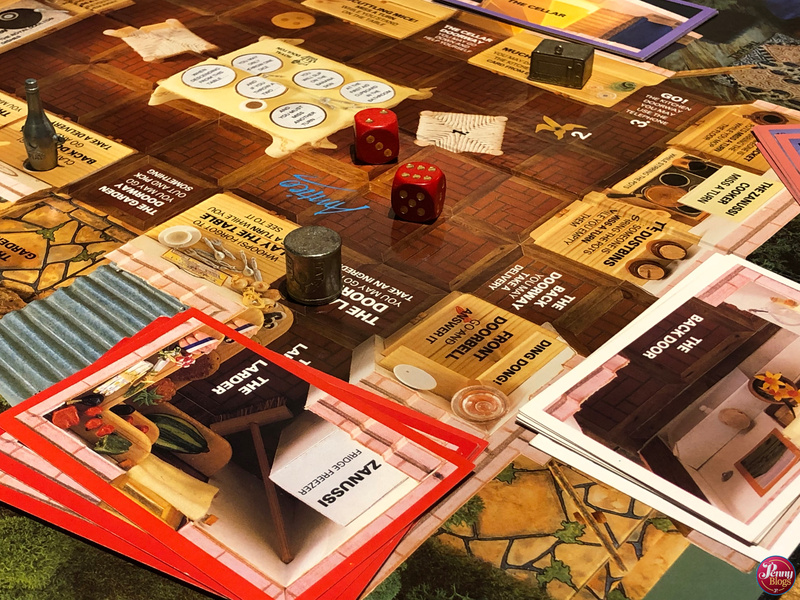 The Kensington board is supposedly based on a design found in flowerbeds in London’s Kensington Gardens, and that’s where the name of the game comes from. It is a geometrical board based on a rhombitrihexagonal tiling pattern, which means that it contains hexagons, surrounded by alternating triangles and squares. All these patterns interlock. The board has a total of 7 hexagons on it. Three at the middle coloured white, two red ones at one side and two blue ones at the other side. The two players (or the two teams) in the game are allocated either red or blue and are given 15 counters of their colour. The game starts with all counters off the board. Once play is ongoing counters are positioned on the corners of the triangles, squares and hexagons on the board. The aim of Kensington is for you to surround one of the hexagons (either a white one, or one of your colour) with one counter on each corner. Play falls into one of two phases. In phase 1 each player takes turns to position one of their counters on the board. Once this stage is complete you move on to the imaginatively titled phase 2. In phase 2 players take it in turns to move one counter at a time on the board. To move a counter you can slide it along one of the green lines to an adjacent corner position. The twist in the game is that if you make a move that means you take control of either a triangle or a square on the board (by occupying all three or four corners) you can then move one (or two if you’ve taken control of a square) of your opponent’s counters. The rules sounds a bit vague here, but having checked online, you are allowed to pick up any counter(s) and put them on any unoccupied position anywhere on the board. At first we were a bit bemused by the whole game. We started off by putting our counters on the board, without really knowing, or understanding, where was “good” to position them. We also then went on to make the mistake of forgetting about what happens when you take control of a square or triangle. The game’s quite dull if you do that! 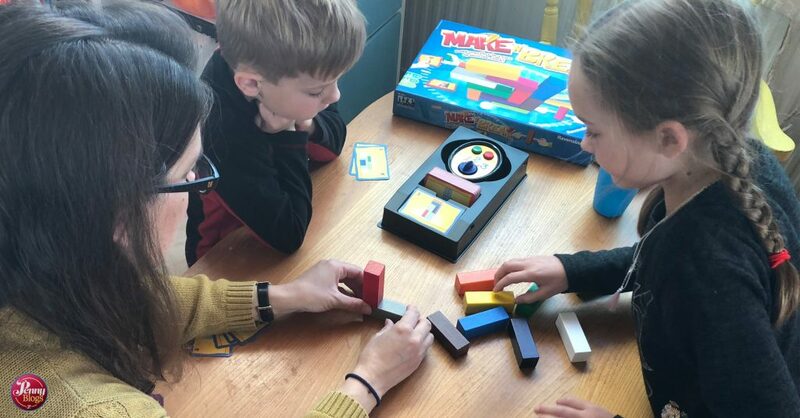 Once we’d checked the rules again, and realised what we were doing wrong, we understood better the advantages of positioning yourself so that you can keep taking triangles and squares, and the advantage that gives you in the game. Suddenly you go from something quite pedestrian, to a much more challenging and tactical game. We can certainly now see why it was compared to chess and draughts in terms of the strategic gameplay needed to try to win. Online research (thank you BoardGameGeek) suggests that the version of Kensington we found was actually the second one released. 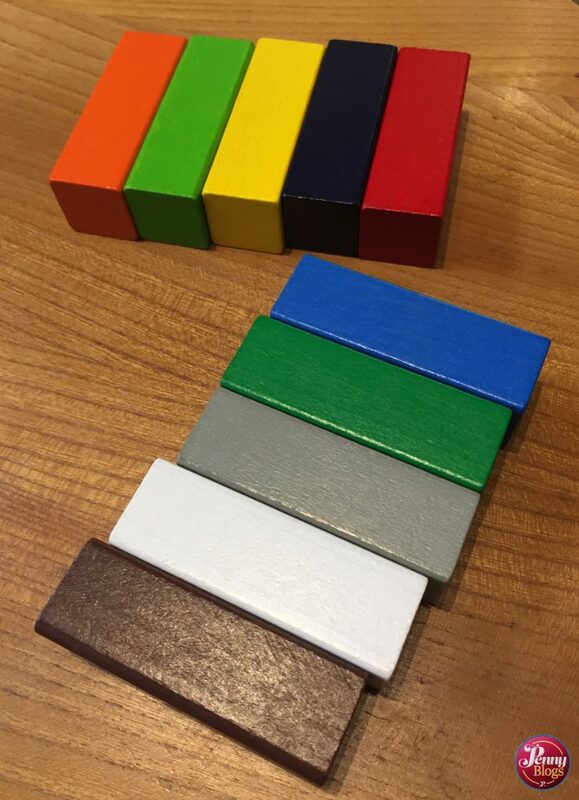 The first came in a traditional board game box and also included 20 of each colour counter, rather than the 15 we have. I understand that made the game even harder, as there was less space on the board to move, or reposition, counters to. I also came across a Commodore 64 version of the game (on cassette, of course) which vaguely rang some dim bells from childhood. Although I seem to recall it being quite dull and I’m pretty sure that playing against a computer (who would be making their moves following very specific rules) would be somewhat harder. The game’s instructions include variants for four and six players. In each case you still have a total of two teams, with each player being allocated a certain number of counters (8 in a two player game and 5 in a three player game). Players then work in a team, but do not communicate with their other team members. Based on my experience of needing to concentrate on what you are doing in Kensington I can’t imagine it being a very sociable game to play with six players. More of a strange silence descending on a dinner party. As I touched upon at the start of this post, the version of Kensington we have is in a record sleeve design. Whilst the board fits nicely inside, this it does mean that the playing pieces are rather strangely attached to the back cover. To be honest they are a complete pain to get out of here, and if you were playing it regularly I can see the packaging getting quite damaged by repeated attempts to get the counters out. Kensington was published in 1979 by Whale Toys Ltd, and was designed by Brian Taylor and Peter Forbes. It is for either two players, or two teams, which can each have either two or three players in them (so four or six players in total). The recommended age range on the packaging is 7 – 107. I’m not convinced that all 7 year olds would get the strategy aspect of the game, but they certainly would understand the rules of play. A secondhand version of Kensington is currently available on Amazon here, with further copies available on eBay. Interestingly, Amazon also have available a book with the title Winning at Kensington. Priced at £48 I’m not going to be rushing out to buy a copy, but I’d certainly keep an eye open for it when doing my usual trawls of charity shops and secondhand book shops! 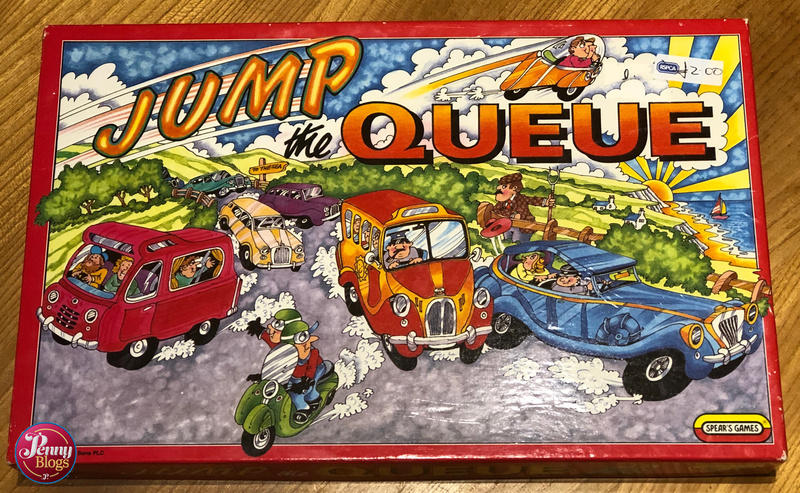 Transport related games are always a hit in our house and I was therefore intrigued to come across Jump the Queue for just £2 in a local charity shop. I noted that it was from Spears Games and having had so much success with their games previously I didn’t really give it much thought before paying for it. After all it was only a couple of quid. But it was £2 very well spent! Jump the Queue was released in 1989, but the whole game has a very 70s or early 80s feel about it. The illustrations on the board and the playing pieces really remind me of those in some Ladybird books from the early 80s. The aim of the game is to score the most points by beating your opponents in a race to a beach resort in various modes of transport. 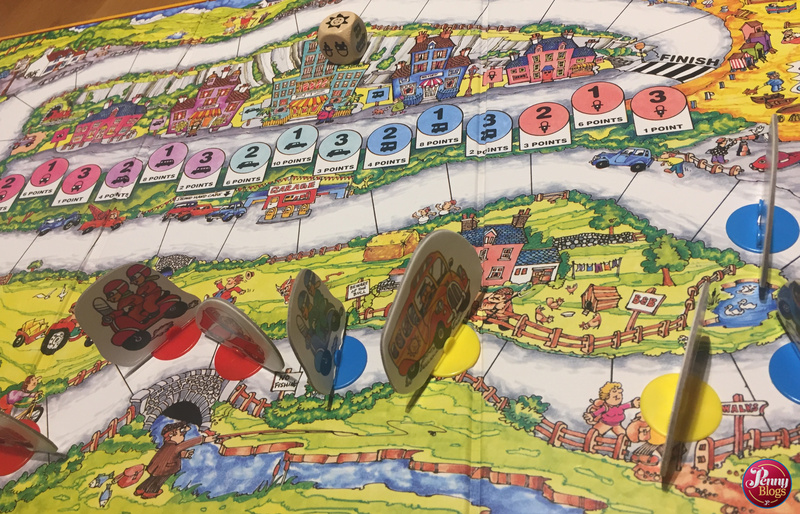 Each player has five different vehicles that they are trying to get to the resort: limousine, coach, camper, bubble car and scooter. Just the inclusion of a bubble car in this list gives it a vintage feel. 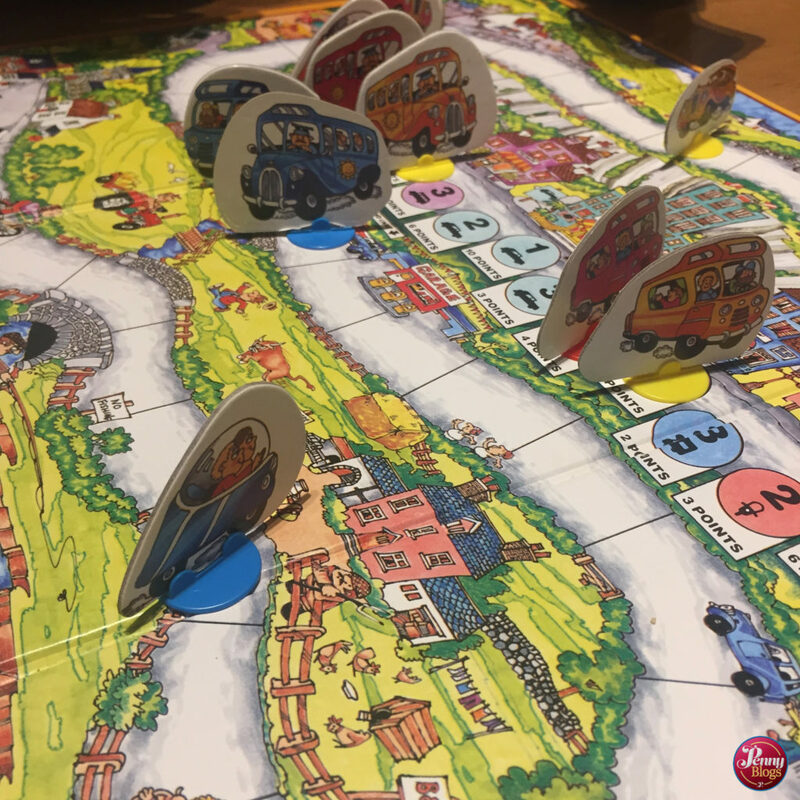 Each different mode of transport is headed to a different seaside hotel and the player who gets there first gets the best parking space, with the most points attached. The game starts without any playing pieces on the board. As each player takes their turn they roll the special die which tells them which playing piece they should move, but not how far they should move it. That all depends on how long the queue is. The way the game works is that you move your playing piece to the first available space on the board, jumping any queue that might be in your way. Hence the name of the game. You can play with up to four players, and this can mean some quite long queues that need jumping! The die also has on it a “joker” and if you roll that then you are allowed to move any vehicle, but more importantly, you can have three moves. So this could mean that you move one vehicle three times, or instead that you’ve three different vehicles. Whichever you decide it can make a real difference to how you are doing in the game if you roll a joker. 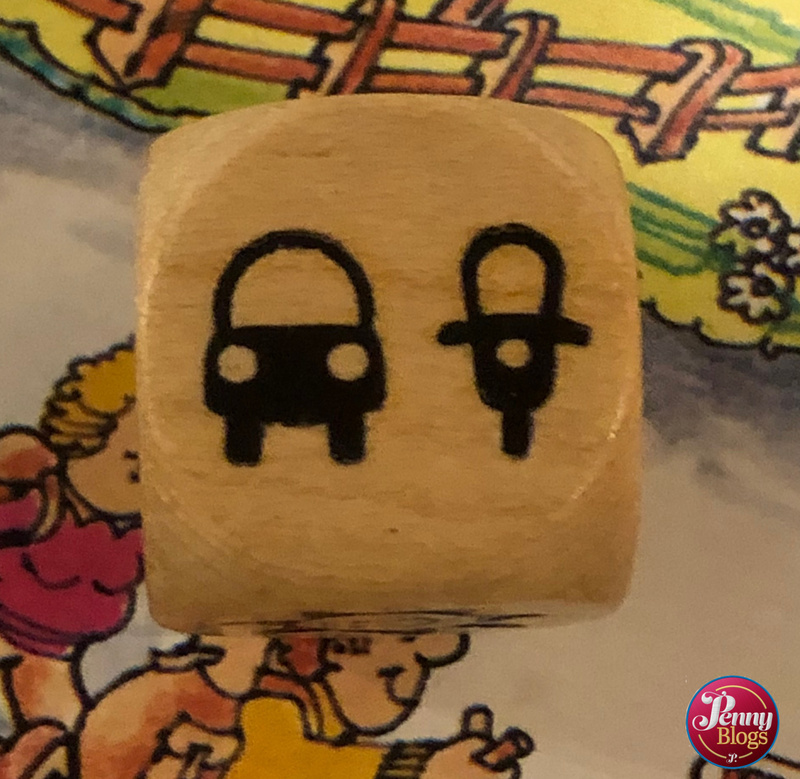 When you get to the end of the route on the board with a vehicle, moving it over the zebra crossing, you can then park your vehicle at the designated hotel. Each hotel parking slot has points attached to it. If you’re the first player there then you get the top parking slot, second you get the second best one, and third the third best one. However, if all three spaces at the hotel are full you have no where to park your vehicle, and so get zero points for it. Hence, you have to be a bit strategic in how you play the game and which vehicles you move when. The game ends when all five top parking spots are full. This may mean that one or more players still have pieces out there on the board, or maybe have not managed to get a single vehicle to the seaside destination. This is why the order in which you move your vehicles can be so important as the game progresses. The most complicated part of the game is probably working our each player’s score at the end. It does add a level of mystery to the game though as unless you keep on top of everyone’s scores you might not know who is actually winning. With five vehicles to park it’s not necessarily just a case of getting all five there to win, but depends on when you get there in comparison to the other players. Produced by Spears Games in 1989. For 2 – 4 players, aged 6 to adult. At the time of writing there is a copy available to buy secondhand on Amazon UK here and also a copy on eBay UK. A couple of weeks ago my daughter came home from school with a copy of the Guinness Book of Records from the school library. She’d reached that stage that I think all children get to when they suddenly realise that there are people out in the world doing some crazy, crazy things so that they can become a world record holder. Admittedly there are the more serious records for sports and other notable achievements, but then there are also things like the record for the largest collection of rubber ducks (5,631 at the time theGuinness World Records Challenges game was published, in case you were wondering). She spent the week pouring over the book and also put in a request to Father Christmas for the latest version as a Christmas present. 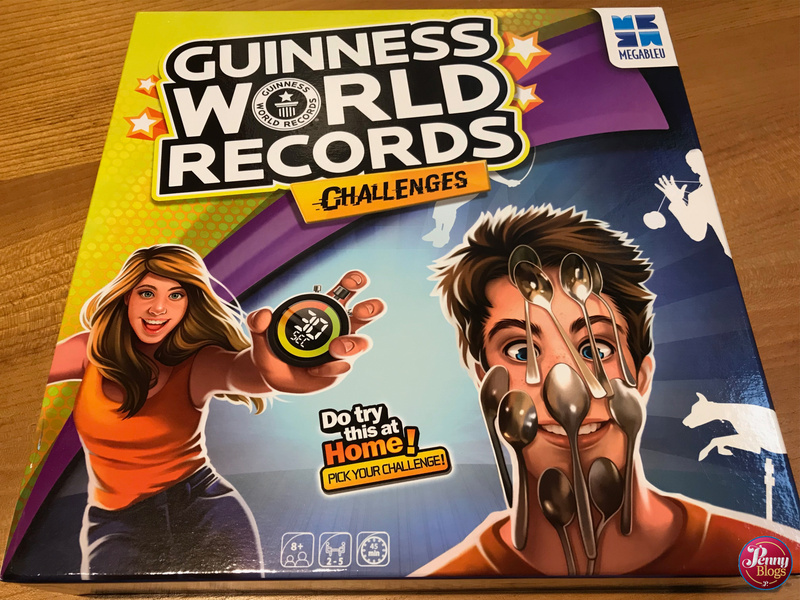 I had no idea that there was a broad game based on Guinness World Records until I was asked to review Guinness World Records Challenges. Seeing as she was so addicted to the book I guessed that this was something LMC would enjoy, and how right I was. The aim of Guinness World Record sChallenges is to be the first player to get to the finish line on the board having completed three challenges during your journey. Let me explain what I mean by challenges and how play actually works. 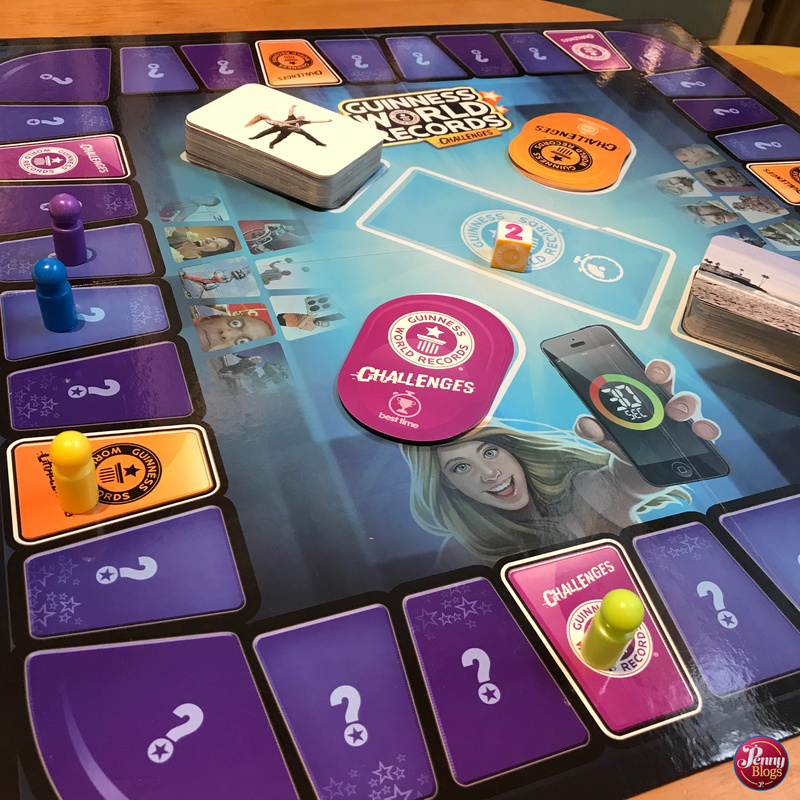 Guinness World Records Challenges has a standard style board where players take it in turns to roll a (special) die) to work their way around the board. They start (unsurprisingly) on the start square, and continue in a clockwise direction taking it in turns. On the board there are three different types of squares that you can land on. Question squares – where you answer a question relating to an existing record – or two different types of challenge square. These challenge squares can be one of two types: Best Time or 30 Second challenges. 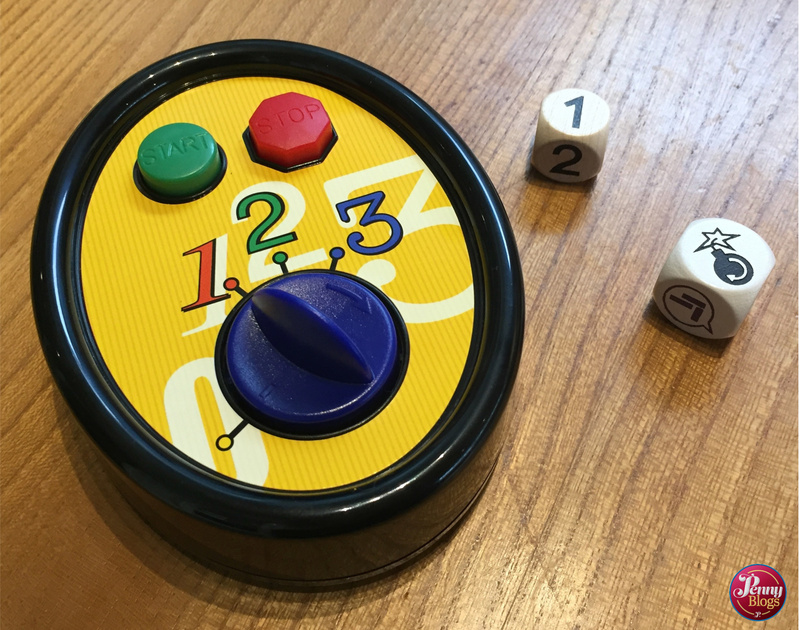 The die used in this game is unique in that it has the numbers 1 to 4 on it, but also two challenge symbols: one purple denoting Best Time challenges, and the other orange for 30 Second challenges. If you roll a number on the die then you simply move forward that number of spaces. If you roll one of the challenge symbols then you simply move to the next challenge symbol of that colour on the game board. If you land on a question square you pick up one of the 150 question cards. On each there are details of an existing record and then four related multiple choice questions. The number you rolled on the die tells you which question you will be asked from the card. If you get a correct answer then you roll again and have another go. If you get it wrong then play moves on to the next player round the board. You can access the challenges in two ways during game play. Either by rolling one of the challenge symbols on the die, or by landing on one of the challenge squares as you move around the board. Once you do either of these you can then choose between picking up a challenge card and completing it yourself, or choosing another player and challenging them to beat you in a particular challenge – either by doing something faster (in the case of a Best Time challenge) or doing more of something in a 30 Second challenge. If you win the challenge then you get to keep the challenge card. You need three of these (at least one of each colour) to win the game. The challenges in the game vary quite a bit, but that’s what I think makes this game very accessible to people of all different ages and abilities. 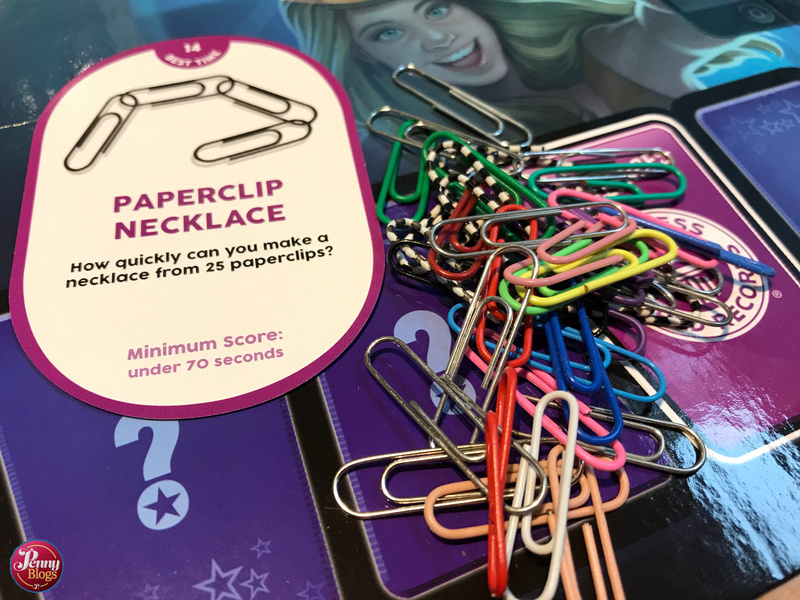 It could be something from how many star jumps you can do in 30 seconds, through to how long it takes you to create a necklace of 25 paper clips. Let’s be honest – there’s one of these that I would expect my six year old son to be able to do quite easily and another which may be more suited to his Granny! The nature of the challenges mean that the game instructions do include a list of household objects that you need to play. These are things that you probably would have around, but it may just be that you need to find them before you start playing. When you start each game you don’t need all the challenge cards out on the board (the instructions tell you how many you need based on the number of players) so you can filter out any challenges that you don’t have the right equipment to hand for, or that you don’t think will work for the range of players you have round the table. 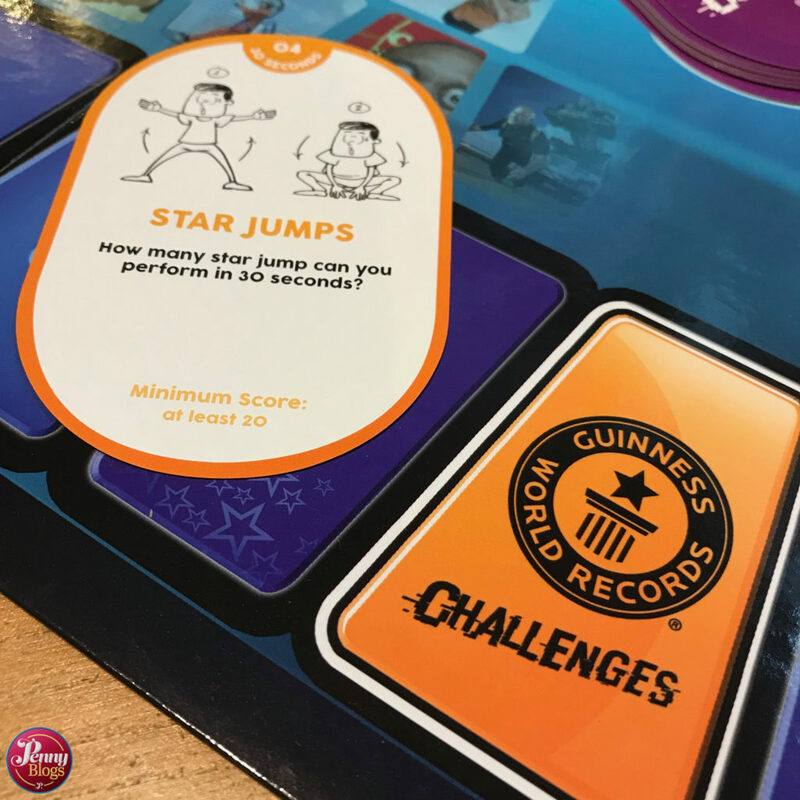 The more I played Guinness World Records Challenges the more I realised just how perfect it is as a family game for players of all ages and abilities. 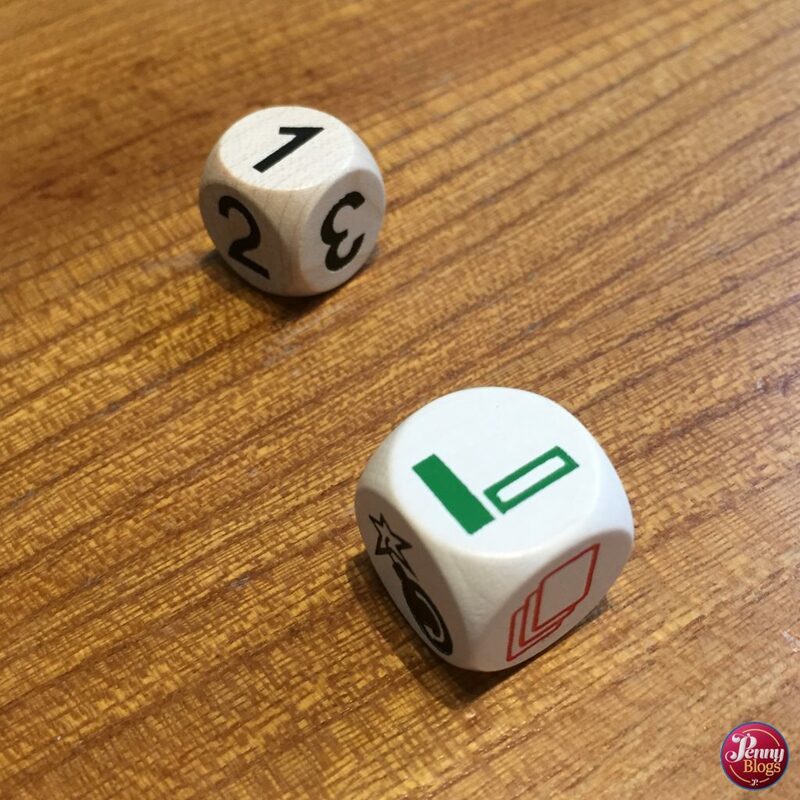 As well as being able to be a bit selective on which challenges may come up during a game, the fact that the questions are multiple choice means that players who don’t know the answer actually have a decent chance of getting the answer correct. In some questions there are three possible answers, in others four and some questions are true or false ones meaning a 50% chance of getting it right. LMC was able to make a couple of lucky guesses so that she didn’t feel like her lack of knowledge slowed her down. Even the adults had to resort to guesses on some. After all, how many people know that Agatha Christie learnt how to surf??? 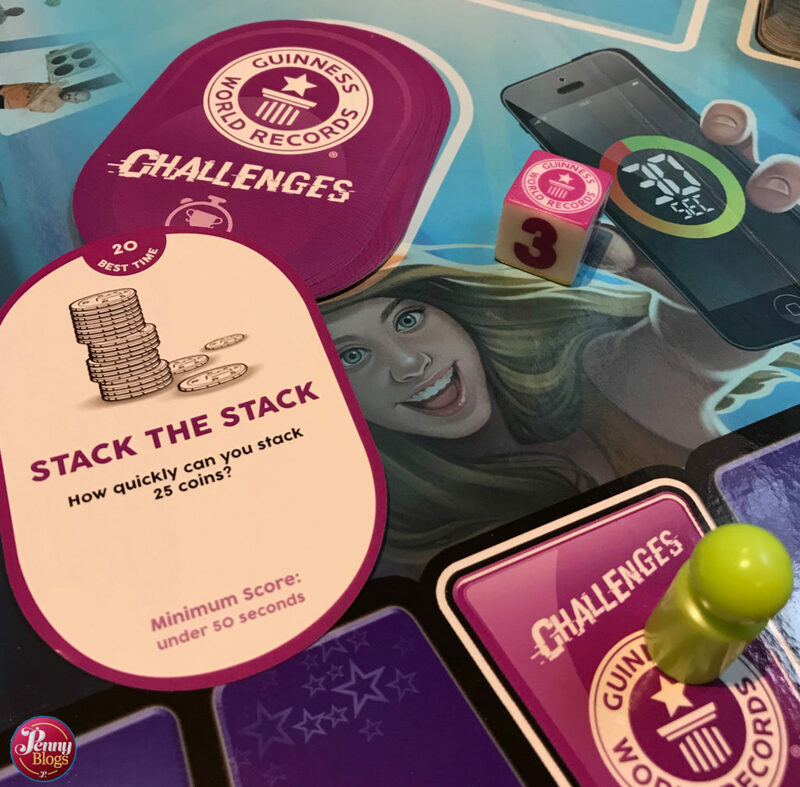 The game comes with a separate booklet of “specific guidelines” for the challenges included, but I looked at that as being very much guidelines rather than rules. As I saw it you can tweak the guidelines again based on who you have playing. The only thing I possibly found a little strange was that the game is for 2 to 5 players. I’m much more used to games having an even number of maximum players, but maybe that’s just me not paying attention all the time. I can definitely see Guinness World Record Challenges being an excellent game to bring out at Christmas. There’s that perfect mix of general and trivia knowledge for the questions, combined with the amusement of the challenges. Whilst the age range on the box is 8+ I think that it’s possible to adapt it a bit for younger players (maybe age 6 and up) whilst still having enough in there to keep the adults amused and entertained. Guinness World Records Challenges is published by Megableu. It is for 2 – 5 players, aged 8+. It is available to buy online here. It has a RRP of £24.99, but is often available for less online. Disclaimer: We were sent a copy of the Guinness World Records Challenges for the purposes of this review. All opinions remain my own. This post contains affiliate links. I’ve spent a fair bit of time recently on the look out for games that both my kids (aged 6 and 8) can play with me and my husband. 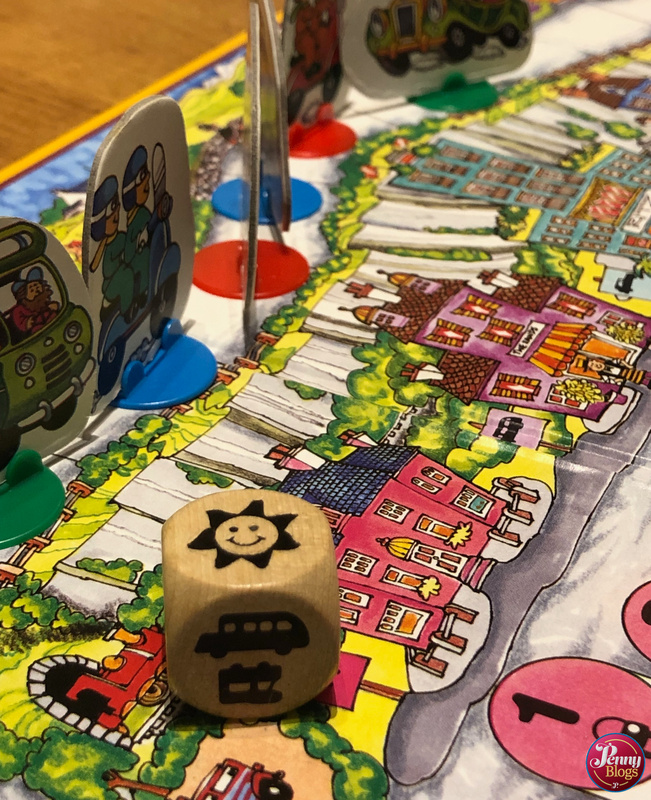 Loads of family games seem to be age 8+ which works for my daughter, but not all of them are suitable for my son – mainly because he’s not a confident, fluid reader yet. I was therefore intrigued when I saw Make ‘n’ Break as I hoped it would be exactly what we were looking for. 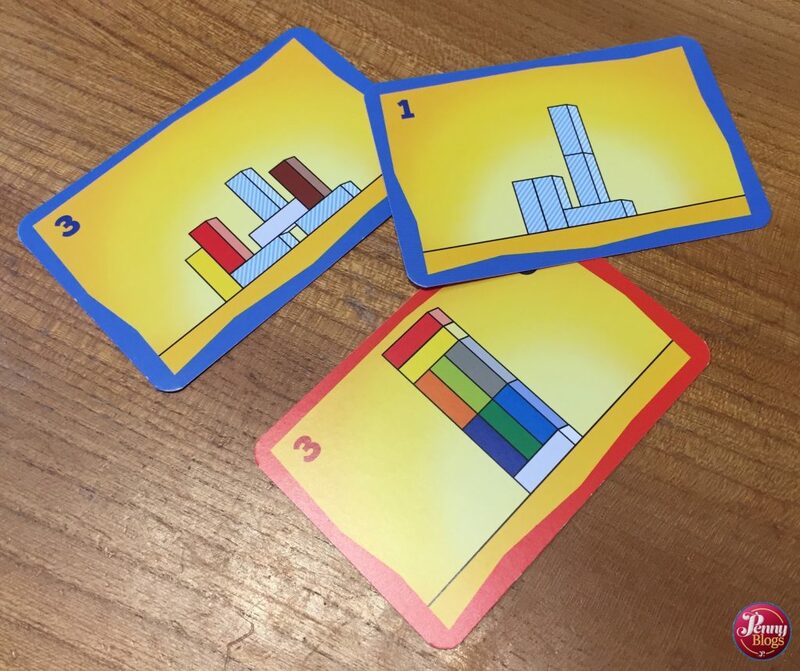 The main aim of Make ‘n’ Break is to use the 10 coloured building blocks to build the structures that are shown on the blueprint cards. There’s a time limit for building them and, depending on how many people you have playing, players are required to co-operate with each other. Let me explain. Master C, Little Miss C and I decided to give the game an initial test run with just the three of us. The way the three player game works is that you are required to work in teams of two to build structures, but each time the team of two is different. This meant that in three goes I had one working with LMC, one with Master C and one where the pair of them had to work together. That’s certainly a test of siblings! 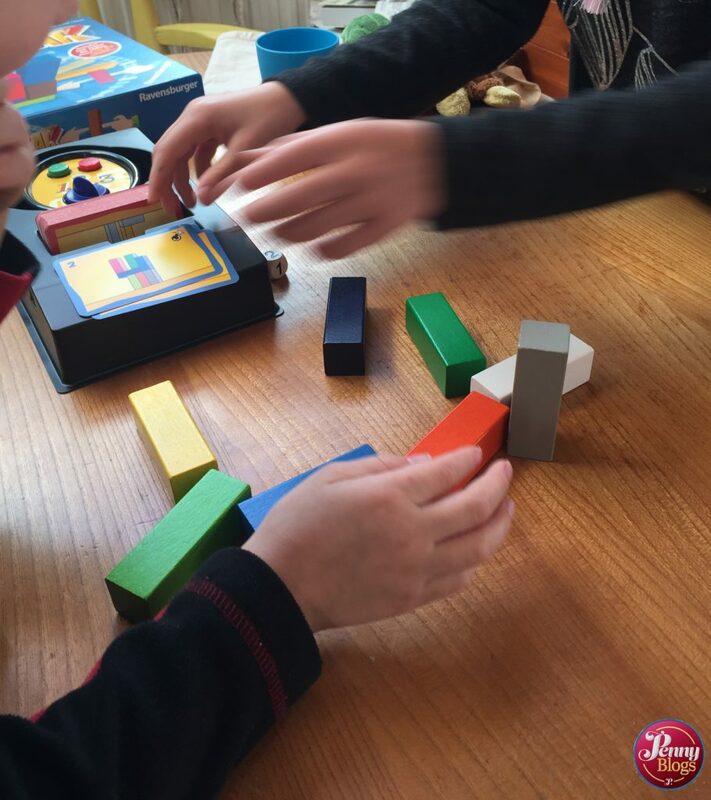 In the basic game (otherwise known as the original game) the two builders in a team start by collecting the building blocks (5 each) and rolling the time die to see how long they have got to build. The timer is set and then as the first blueprint card is turned over they have to start building against the clock. The idea is that they are supposed to only touch the 5 blocks that they chose at the start of the turn – not the ones that the other player has. We were a bit flexible about this particular rule with Master C playing, but you would certainly want to enforce it for older players. Once a structure is complete, and correct, it is broken and each player in the team again is allocated five building blocks. They then start work on the next blueprint and continue in this way until the timer runs out. Players have to build the structures shown on blueprint cards and these can either show the whole structure requiring all the colours to line up, or it may be one where the block colours used are irrelevant. Some of them have a mix of the two where some coloured blocks have required positions, whereas others can go anywhere. You get points for each structure that you manage to build within the allocated time and the way that it works when you are in a team is that both of you score the points for each structure. After three rounds you count up the total number of points per person to determine the overall winner. Until then it’s hard to actually tell who is winning, as each structure has a different number of points allocated to it. 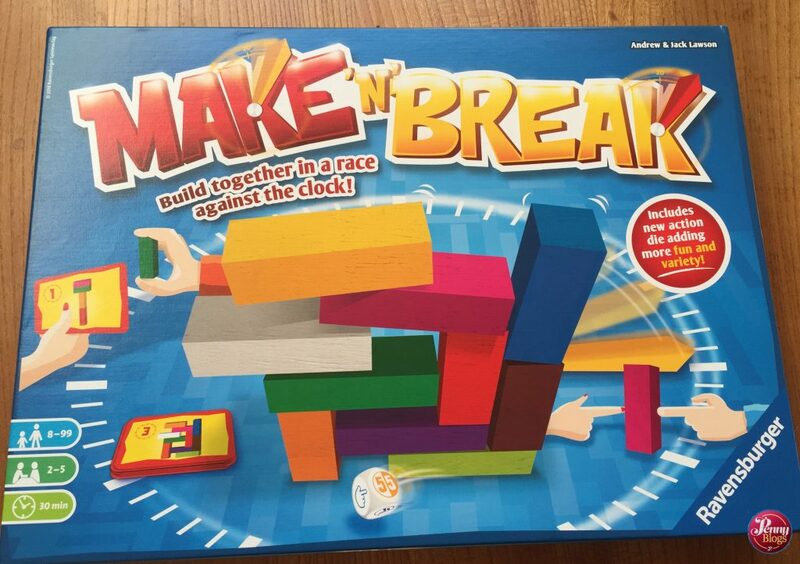 The version of Make ‘n’ Break that I have described so far is the original game. There are also instructions inside for an “action version” of the game. This incorporates the second dice that is in the box. Bomb Bonus – A special bonus round in which players build on their own, but they’re in a race to not be building when the timer runs out. The problem is that the timer is hidden so no one knows how long you’ve got! Make ‘n’ Break completely lived up to expectations in terms of a game that my six and eight year olds could both play with me. Yes, we tweaked the rules of the original game a little bit to accommodate my six year old, but not significantly so. And I don’t think he realised that we did. The thing that I really, really liked about the game though was that it encouraged team work between the kids. They had to work together in a way that they’re not really used to in board games. 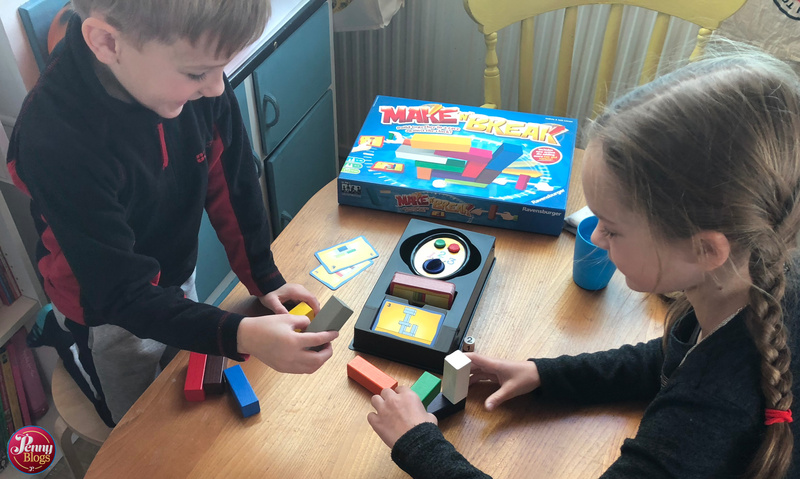 It was lovely to see them cooperating and as I hadn’t really expected that angle of the game when I got it out of the box it was a pleasant surprise to me as we learnt to play it together. I also really liked how frantic the game could become. A real race against time, whilst still trying to be careful with what you built and follow instructions accurately. Great for practicing those fine motor skills that I know parents are keen for children to master young and then retain. Make ‘n’ Break is published is Ravensburger. The games is for 2 – 5 players and has a recommended age on the box of 8+. As mentioned above, Master C is six years old and happily played the basic version of the game with some adult help. It has an RRP of £24.99 but is often available for less online. It can be purchased online here. Disclaimer: We were sent a copy of Make ‘n’ Break for the purposes of this review. All opinions remain my own. This post contains affiliate links.